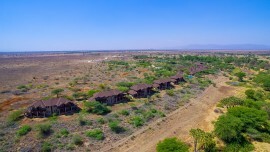 Located on the edge of the Samburu Game Reserve overlooking the Ewaso Ngiro River, Bedouin Camp captures the spirit of a true safari experience, binding luxury and quality with adventure. 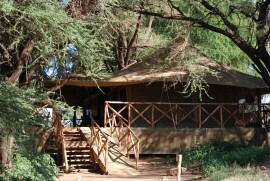 The camp is set within an 83000 acre private safari reserve and the scope of activities here is endless; enjoy night game drives, nature walks, camel treks and many more. 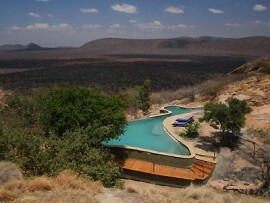 Although famous for the reticulated giraffe, the Samburu also boasts of leopards, lion, and cheetah and bull elephants. Bedouin camp consists of eight luxury tents with four poster beds, sprung mattresses, Persian carpets and flushing toilets. 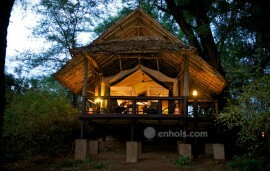 All tents are en-suite and overlook the Ewaso Ngiro River. The tents are furnished with safari antiques, Persian rugs, campaign furniture, flickering lanterns, crisp linen, private en-suite dressing rooms, showers and porcelain flushing rooms. The larger tents at Bedouin Camp can be used in hosting seminars and other social gatherings. It is equipped with sound system and a clip board. The fields and smaller tents on the other hand, can be used for camping and group trips on the fields.